We spent over 80 hours researching and testing 20 different types of canned cat food and found that taste, value for the money, and brand reputation were most important. Friskies canned cat food scored high marks in every category and is our top pick. The cats loved the texture and taste of this canned food and did not have any stomach upset or digestive problems after eating it. It didn’t cause horrible, smelly bowel movements like some of the canned food did. There are 50 different varieties of Fancy Feast canned cat food to choose from. Many people may just grab the cheapest and easiest cat food they can when they feed their cat. The danger in doing this is that it csn cause health problems in their cat that can lead to increased vet bills and other problems as well. Choosing the right canned cat food for your cat will help to ensure that they are getting the required vitamins, minerals and meat that they need to live long, healthy lives. It’s not hard to sort through the multitude of canned cat food products if you know what you are looking for. This guide is designed to help you know what to look for, how to read labels and what the best types of food and ingredients are the best for your cat. Friskies is another well known cat brand. They have provided excellent cat food for cats for a long time. This package deal contains twenty-four cans of wet cat food that is 5.5 ounces each. These cans are 100% complete and balanced so kittens grow up healthy and strong and adult cats maintain their heath as well. This product was manufactured in plants that are owned by Purina and located in the United States. 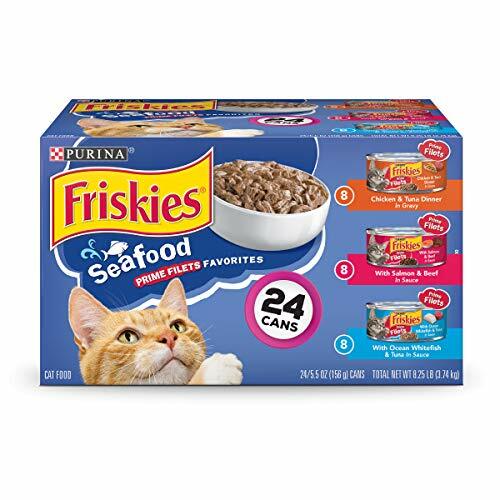 Friskies has many other flavors with ingredients like beef, liver, turkey and other healthy foods that your kittens and cats are going to love. Give your adult cats ¾ to 1 oz per pound of body weight every day. You can divide this into two meals if you desire. Kittens need twice as much Friskies as adult cats do and should be fed as much as they will eat 2-3 times each day. Any food they don’t eat should be refrigerated. 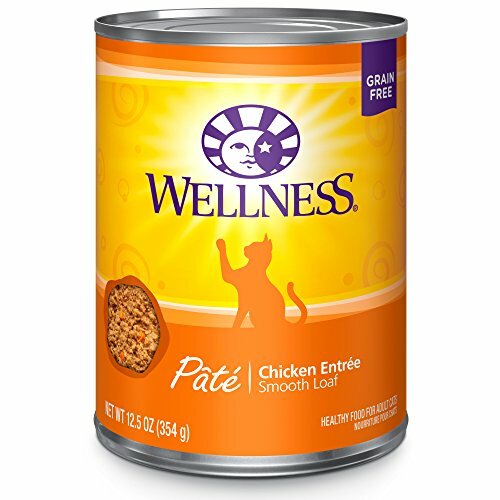 Wellness Complete Health Natural Grain Free wet Canned Cat Food is a healthy cat food for adult cats that has plenty of protein and essential fatty acids that provide complete and balanced nutrition for your cherished cats. The high quality proteins are free of growth hormones and steroids and include other healthy ingredients your cat will love such as carrots, sweet potatoes, whole cranberries, blueberries and more. There are plenty of vitamins and minerals in this quality cat food. These added foods, like the blueberries and cranberries, are good for your cat’s urinary tract health. Hydration is an extremely important part of having a healthy cat. Cats are not prone to drinking very much so this canned cat food adds moisture to your cat’s diet. The 100% grain free cat food will improve your cat’s health and they will enjoy what they eat while it’s happening. You can feel confident about the good care you are giving your cat. They’ll appreciate it too. It is made in North America. Get complete and balanced nutrition for your adult cats with Fancy Feast canned cat food. 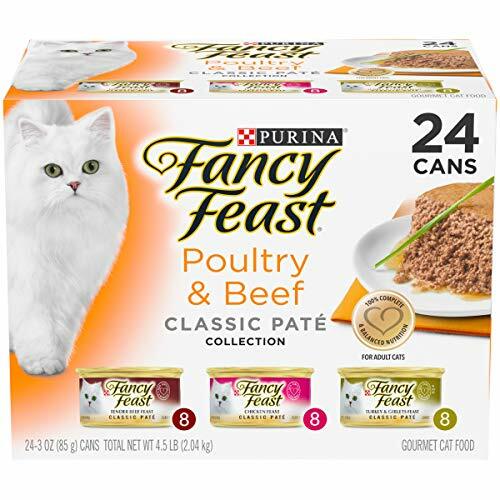 This variety pack offers 3 different varieties for your cat to enjoy: beef feast, turkey feast and chicken feast. This pack contains 24 – three ounce cans that are 100% balanced. Fancy Feast is a well known brand of cat food that cat owners have purchased for a long time. There are more than 50 different tastes and textures in the fancy feast lineup so you can give them all kinds of flavors to try. The fancy feast gourmet wet cat food entrees have been prepared with high quality ingredients as well so you’re cat will love the taste but they will also be getting great nutrition too. What you feed your cats or kittens has a direct effect on their health. With hundreds of choices on the market, it may feel overwhelming to choose one canned cat food that will provide the nutrition your cat needs. The three canned cat foods reviewed here excelled in many areas when compared to other top canned cat food choices. In the areas of natural ingredients, a taste cats love, a great value, and plenty of variety. Read our buyer’s guide below to learn even more about choosing the right cat food for your cat. With this information, you will be able to easily sort through the multitude of choices and make an informed decision that will fit into your budget as well as fit your cat’s nutrition needs. What is a Canned Cat Food? There are several things you need to take into consideration when you are looking for the right canned cat food for your cat. We have put together a few things you need to ask yourself before you start shopping. They are outlined below. Canned cat Food versus Dry Cat Food- Many people give their cat dry cat food because it is cheaper to purchase but a diet of only dry cat food is not enough nutrition for what a cat needs. Choosing the right canned cat food will provide them with the proper amount of protein, vitamins and minerals. Since cats aren’t big water drinkers, the canned cat food adds moisture to their diet that is important for their health. What about raw feeding? – Raw eating is not a problem for cats but not every cat owner has the time or money to feed their cats in this manner. They do have frozen raw cat food that will closely mimic a cat’s natural prey and can add it to canned cat food for a complete balanced nutritional meal. Being Budget Conscious – The most expensive canned cat foods will have a lot of high quality meat, no grain, no fillers, no artificial flavors, colors or sweeteners…and it will be very good for their coat, skin and other health processes as well. You don’t have to spend a fortune to feel your cat or kittens well. The three top choices we have featured here are reasonably priced and provide excellent nutrition for your cat. Look out for Vague Ingredients – What goes into some cat foods you would never feed your cat if you knew about it. Become a label reader and that will help you get the healthiest and most nutritionally sound cat food possible. Ingredients like chicken meal are good for cats. Experts say that high quality versions of chicken meal will have some real chicken meat and sometimes some ground bone too. Avoid Hype – The terms that pet food manufacturers sometimes use is nothing more than hype to make something sound like something it really isn’t. It’s important to read the labels on your canned cat food so you know what you are feeding them. The listed ingredients will be different from one brand to the next. The first couple of ingredients that are listed on the can or bag will be the ingredients that have the most in the food. You want the first or second ingredient to be meat of some kind. Look for chicken, beef, lamb, tuna, salmon and for fats like tallow, lard and oil. Cats are carnivores so pay attention to the food you give them and make sure that it is not strictly carbohydrate based. They need the proteins and the meats and their cat food is the best place for them to get it. Carbs like sweet potatoes and berries are not bad for your cat, so if they are listed in the ingredient list like they are in Wellness pet foods, then you are feeding them something safe. Look for foods that have been certified complete and balanced by the Association of American Feed Control Officials or the AAFCO. This important certification means that the food was actually tested by a board comprised of veterinarians and has been proven to be a healthy and complete food. Meat in the top five ingredients – The higher to the top meat is listed the better, If several meats are listed in the top 5 ingredients that it even better. Grain-free is always preferable and better for you cat. Limit Carb Sources – Cats are carnivores so they don’t need a heavy carb diet. In fact in many cases a strictly carb diet or heavy carb diet can be extremely bad for cats. Things like wheat, corn and soy can cause allergies. Avoid Artificial Preservatives – Things like BHT, BHA and ethoxyquin should be avoided. They are artificial preservatives that can cause problems. Stay away from By Products – even though in the wild a cat would eat bones, fur, internal organs and other things, having them added at the plant doesn’t seem like such a great idea. Look for the purest ingredients you can find. UThere are two basic methods of feeding a cat: Free feeding and Scheduled Feeding. You can choose one or the other based on your lifestyle, the needs of the cat and other factors that pertain to when you feed them. Free Feeding Your Cat – Free feeding means that you have the cat’s bowl filled at all times and the cat can eat whenever they want. With a free feeding schedule, you will put dry in the bowl and then once a day you can schedule a canned cat food feeding. There are some things you need to watch out for when it comes to free feeding. Some cats will overeat, so if you notice that your cat seems to do nothing BUT eat, you may want to reconsider the free feeding method and schedule 2 -3 feedings per day where you regulate how much they are eating. Do not leave canned cat food out all day long. It can draw bugs and get crusty and hard. Feeding Your Cat on a Schedule – If you feed your cat canned cat food, you will need to schedule their feedings. You csn leave dry food out for them if you choose and they are not eating so much that they are gaining weight unhealthily. For the canned feedings, feed them once in the morning and once at night. If you don’t use everything in the can, be sure to refrigerate it in between feedings. When it comes to feeding your cat the best cat food it helps to know a little bit about what makes a good quality canned cat food. We have gone over the things that you should avoid when looking for a good quality cat food. Avoid fillers and artificial ingredients, and make sure that the canned cat food you choose has plenty of protein sources in it. The information in this buyer’s guide and the reviews that we have conducted on the three top rated canned cat food choices should provide you with plenty of information to sort through the tons of choices that you encounter on the market today. With this information you will know what ingredients to look for, which ones to avoid and you know the dangers that certain ingredients can cause. Now you’re ready to choose the right food for your cat and ensure that they remain healthy and active for a long time.